Yes, I know, sounds like the title of a Moody Blues album that came out in the late 60's. Deb & I moved to Southern Oregon, fresh out of San Jose State, in 1975. San Jose was quite obviously a dead end. We were just a couple more rats in the cage down there, and there was no way that we'd ever get ahead. And so, one weekend in November, we hopped in our Toyota Land Cruiser, and followed our nose. We stopped in Medford for gas and it started snowing. A novelty for us flatland "kids", since we'd seen snow in the "valley" only once in our 20 some years there, and it was an absolute wonderment. The next day we found a place to rent, and made a mad dash back to San José, where we gave notice at our "valley" jobs and served out our time. That done, we loaded our meager worldly possessions in our VW square back and the U-Haul trailer that I'd haul behind the Land Cruiser and made the pilgrimage back north. We settled in quick and easy. Priorities in order, we set out to locate fellow bottle collectors. A local bottle club, the Gold Diggers, was legendary in these parts. Marvin & Helen Davis (authors of many early bottle books), Wes & Ruby Bressie (diggers extraordinaire), Terry Skibby, Howard Heitz, and other famous names, were part of this club which dated to the early 1960's. Sadly, the Gold Diggers had recently disbanded. 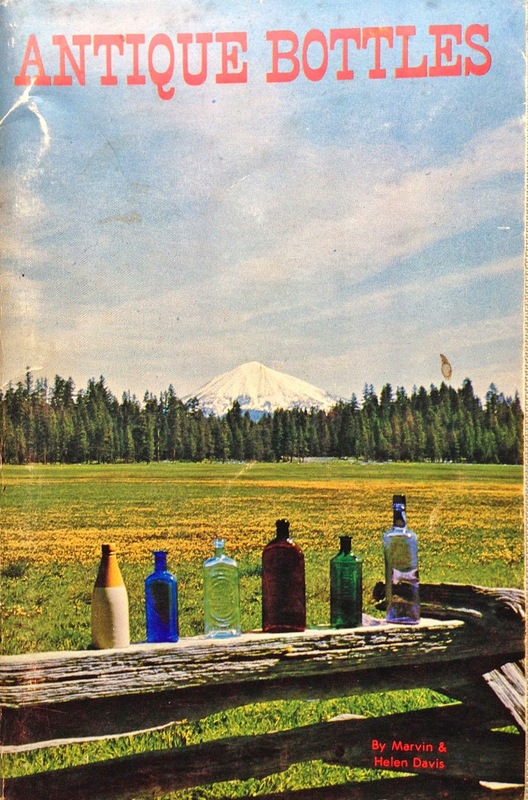 A new startup club, the Siskiyou Antique Bottle Collectors, was meeting later that week to fill the void left by the old club, and we received an invitation to attend. Not long afterwards, we met Marvin & Helen Davis in person. 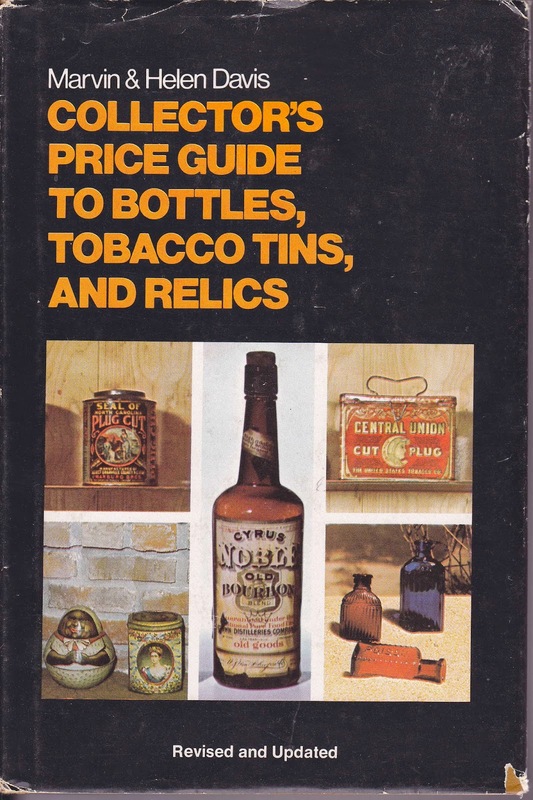 They were kind enough to autograph our copy of their book, "Antique Bottles". I'd received it as a gift in 1969, and had proceeded to "read the ink off the pages" since. By then, they'd written other books, including a Collectors Price Guide to Bottles, Tobacco Tins and Relics, which they'd just finished. Marvin showed me a copy. One bottle on page 33 a bottle caught my eye. 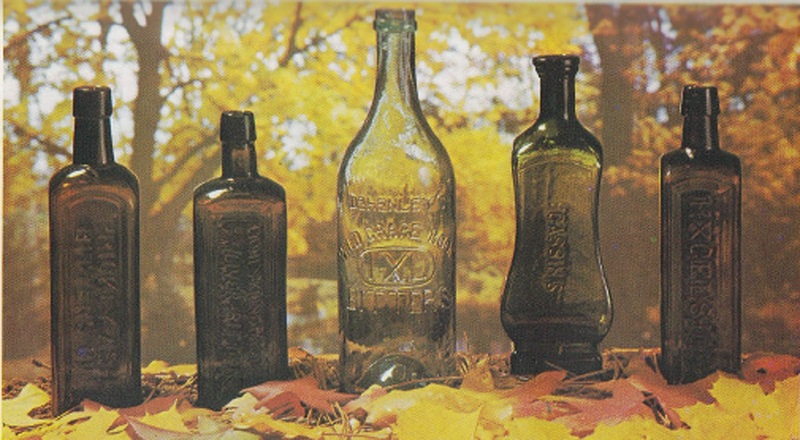 It was an odd shaped bitters by the name of Cassin,s. Not just any Cassin,s, (like I'd ever seen another to compare it with) but a bright green one that sparkled like a new penny. Wow, I remarked, a bottle worth $100~?!. "I'd sure like to see that one"! Marvin said he'd see what he could do. The phone rang the next week; It was Wes Bressie, and he'd made arrangements for us to see the bottle. The following morning we were off to Ashland, where we pulled up in front of a huge Victorian mansion above the boulevard. A knock on the front door was answered by a middle aged couple, and we were invited in. "Oh yes, the bottle." As we moved through the parlor, past the formal dining room and into the kitchen I spotted the holy grail. Illuminated by the morning son, on a window ledge, sat the most incredible bottle I'd ever seen. They invited me to pick it up, as long as I was careful. I'd just been bitten by the bitters bug! Funny story, they said, as we went into an adjoining room. They'd moved the century old upright piano from one side of the room to the other. It had played fine before, but one key had started making a clanking noise after the move. Thinking that one of the 100 year old strings had let loose, they called in a piano tuner. Imagine everyone's surprise, when the back was removed, and the culprit proved to be not a broken string, but an unbroken old bottle instead. And so, the Cassin,s bottle had sat in the window sill ever since. They liked the way the sun played off of it. So did I! A few years later I was making decent money, had started to build a respectable western bitters collection (in addition to the whiskies) and thought I'd take the next step up the collecting ladder. Heck, I figured I'd just go straight for the top rung! Cassin,s or bust! We'd bought a place in Ashland, just a few blocks away from the mansion and one day I stopped in unannounced. They remembered me and invited me in. Sorry, the bottle was no longer residing in the kitchen window; it was now double wrapped in socks and passing time in a safe deposit box. And no, it wasn't for sale for any price. (Seems that I wasn't the only one who knew about the Cassin,s and who had tracked it down.) The main difference is that although I was prepared to offer more than the $100~ estimate in the book, someone else had already dangled $5000~ in front of them. That offer scared them and since they'd been offered $5K, they thought that it might be worth even more. In the early 80's I figured I'd make another run at it since I could now afford the price of admission. I made a trip to the bank, withdrew enough $100~ bills to choke a mule, and confidently made another unannounced appearance. A stranger opened the door. Sorry, the previous owners had sold and moved. No, they didn't know where they'd moved to; "somewhere up north" they thought. My heart sank through my boots. Time passed and one day, in a moment of inspiration, I decided to make a concerted effort to track down the folks and the bottle. Off to the library I went, and sure enough, in a city not too far north of here, I found both husband and wife listed in a phone directory. With renewed confidence, I sent a letter to them. It came back like a boomerang stamped, "return to sender, not at this address, unable to forward". Disgusted, I pretty much gave up on ever finding the bottle again. And then one day, a friend of mine, with more resources that I had, offered to pick up the trail for me. About a week later, Bill called. Success! He'd found them. They'd moved twice, but were still up north. Armed with phone number and address, I wasted no time. A phone call this time instead of a letter. The Cassin,s would be mine. Finally! "Hi, remember me from Ashland?" "I'd still very much like to buy your Cassin,s bottle~". "You what?" "Just a couple of weeks ago?" "For How Much!!??!!" On the flip side, the owners got a significant amount for it, both the buyer and seller were happy, and the new owner turned out to be the same person that had crossed my path many years before. The "lost Cassin,s" now resides in a collection in the S.F. North Bay, no doubt flanked on both sides by other Cassin,s.